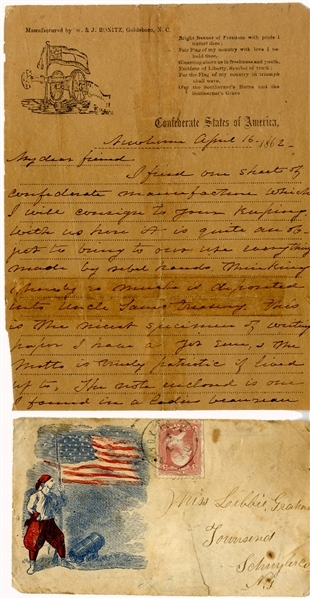 War-date Union soldier Autograph Letter Signed by Samuel Flagg, 25th Massachusetts Infantry, one nice Confederate patriotic lettersheet, Newbern, North Carolina, 2pp. octavo, April 16, 1862, with Union patriotic cover, and reads in part: “...I find one sheet of Confederate Manufacture which I will consign to your keeping. With us here it is quite an object to bring to our use everything made by Rebel hadns...This is the nicest specimen of writing paper I have as yet seen & the motto is truely patriotic, if lived up to...” Repairs, else very good condition.